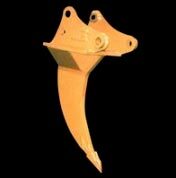 Specifically designed to pre-rip frozen ground or tough soil that exceeds the bucket's recommended duty. Can be used to remove stumps, roots or re-bar. T-1 steel is utilized in all critical and high wear components. The ripper body is supported by rigid gussets for extra rugged applications. Werk-Brau Company, Inc., 2800 Fostoria Road, P.O. Box 545, Findlay, OH 45840-0545. Tel: 800-537-9561; Fax: 419-422-7207.